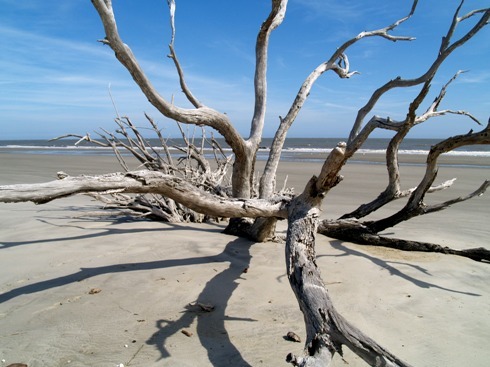 A team of Skidaway Institute scientists visited Ossawbaw Island this week. 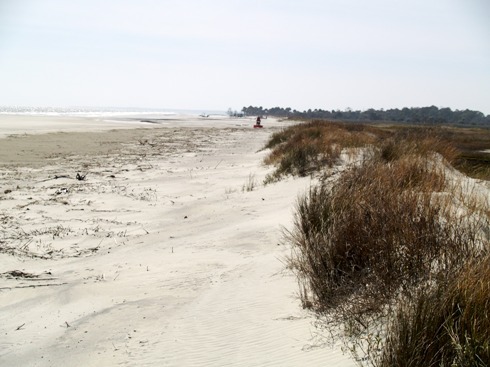 One of the main reasons for the trip was to perform some maintenance on the Barrier Island Network. 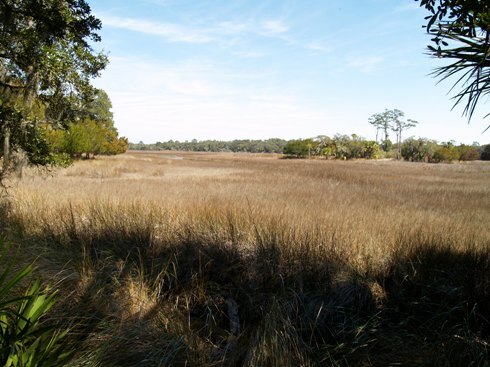 Skidaway Institute is one of a group of organizations developing a network of cameras and sensors that will turn the island into a remote laboratory for researchers and students. Right now the network consists of a weather station, a water monitoring sensor at the main dock, two more in wells in the interior of the island and a camera at the dock. You can access the pictures and data here. 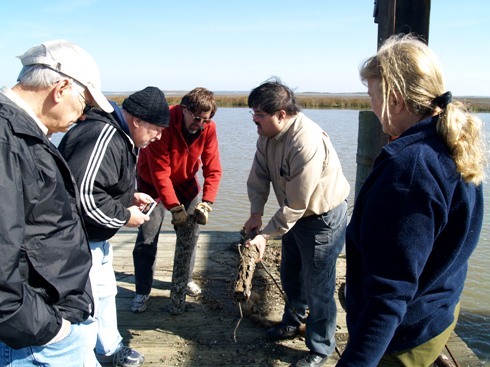 (l-r) Herb Windom, Bob Antonelli, Charles Robertson, Sam Cook and Debbie Wells examine a a sensor that spent a little too much time in salt water. The technical crew needed to change out the sensor at the dock and install a sensor in one of the wells. Long-term exposure to salt water is very rough on scientific equipment. 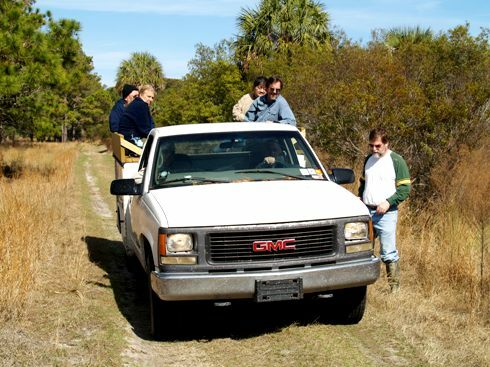 We got around mostly in pick-up trucks. Also, the geology team of Clark Alexander and Mike Robinson tramped through the woods to find a good site to obtain core samples. 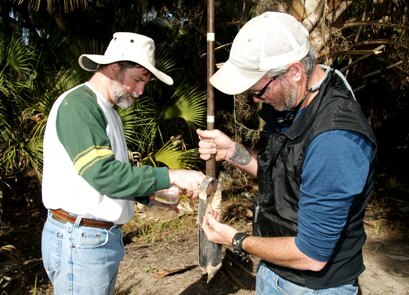 Clark Alexander and Mike Robinson emptying a core. That is part of a project to date the origin of the island. 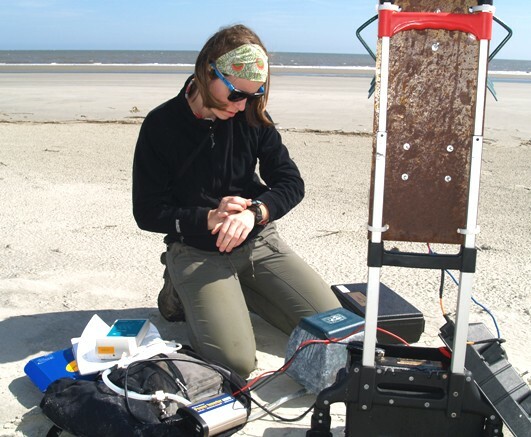 Kathryn Sutton at the beach with her air sampling gear. 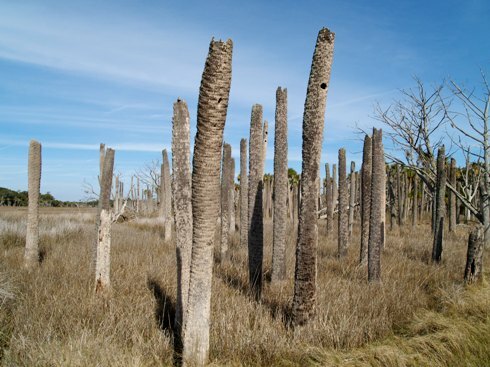 Georgia Southern grad student Kathryn Sutton also went along to obtain air samples from the beach and to collect Spanish moss for her research project looking at the possibility of using Spanish moss as a bio-indicator of atmospheric mercury from coal-fired power plants. The team also placed a new sensor in one of the two research wells on the island. 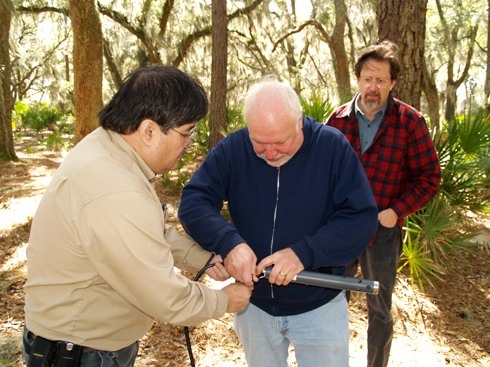 Sam Cook (Siemitsu Computers) and Bob Antonelli hook up the well sensor while Charles Robertson looks on. Heb Windom and Paul Pressly meet "Paul Mitchell." 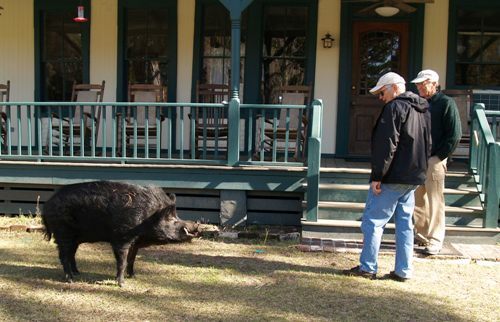 It was a beautiful day and the island scenes were, as always, a treat.